WELCOME TO THE INDUSTRY'S PREMIER MUSIC VIDEO POOL. We are the undisputed source of high-quality HD music videos, mixshow tools, and remixes for professional video DJs. Our quality sets the standard for a reason. Our music videos are pristine. But we'll let you be the judge. Access to the largest music video pool in the world. Genres including Hip-Hop, RnB, Top 40, Country, Latin, Reggae, Moombah, House, Electro, Trap, Dubstep & other EDM. In the event of a hard drive failure or a computer crash, our Cloud Rescue feature will get you back up and running fast. Because of our proprietary encoding processes, our TRUE 1080p videos will compliment your 4k displays. A variety of resolutions to not only fit the original video source but your application as well. SD, 540p qHD, 720p HD, 1080p FULL HD (true/real high definition). The industry’s widest selection of VJ/DJ mixing toolz available. Extended mixes, remixes, intros, outros, transitions, acapellas… Snipz, Xtendz, BlenX, BlenX-In. Fully syncable. On all of your devices. On your iPhone or Android. On your Mac or PC. Or even in the club. SmashVision members can access content from anywhere at anytime through our cross-platform apps. With the iPhone/Android app and Desktop Downloader, you can preview, queue and download videos remotely to your local machine — watch the downloader fill up your crates automatically. 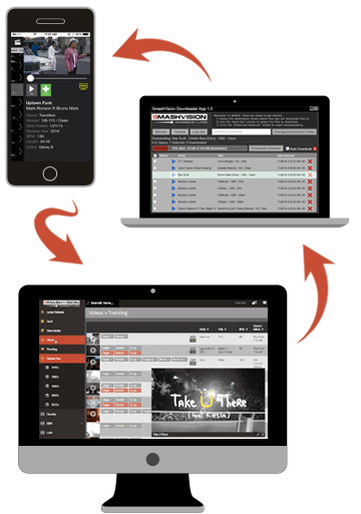 We've integrated with crateQ to bring you the best download experience in the industry. Search, Download, Drag+Drop. We have partnered with the premiere website for audio remixes & edits, Direct Music Service, to bring you the official videos for their exclusive audio content. Serato, Virtual DJ, rekordbox & Mix Emergency ready. Our videos come uniformly tagged and cued with pre-built overviews. Download, drag, drop. Done. Digitally remastered Old School & Classic videos like you've never seen them before. Seriously though: we spend countless hours breathing new life into old music videos with our proprietary inverse telecine techniques. Audio generated visuals for must-have tracks with no official music video available. Core features for the professional VJ. What do the different colored buttons mean? The RED buttons are the explicit versions. And the GREY are the clean ones. What are your video tools? BlenX in (acapella in): whole-hook in with acapella followed by full song with 32-beat/8-bar outro. SynX are our audio-generated visuals for must-have tracks with no official music video available. or drop us a line on our live chat. © 2019 Lodestar Entertainment, LLC, All rights strictly reserved without exception. No content, copy, trademark, images or reference to same may be reproduced or utilized without permission. Content represented herein is for use only in ASCAP, BMI & SESAC performance rights compliant venues for promotional purposes only as defined by the US Copyright Act (USC: Title; 17). In Canada under license granted by AVLA and in accordance with Canadian Copyright Law and in the UK license is granted under both the PPL/VPL and the PRS respectively.